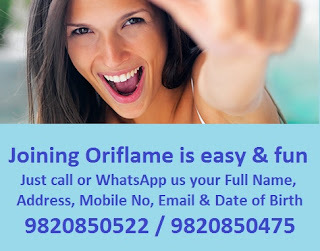 Oriflame joining offer in June 2019 is that anyone can join Oriflame for free and get welcome program gifts. So Oriflame membership fee is zero till Oriflame recruitment campaign ends. Explore the Oriflame world in June 2019 and get amazing gifts. You can also recruit others and get even more exciting gifts. When you join Oriflame you get the opportunity to start your own business with Oriflame. You can now download the latest Oriflame catalogue in PDF Format and start showing your friends the exciting offers right from your smart phone. You will get discount or commission of 20% on all orders you place. All your ordered products can come directly in your home by courier. So now you an explore the Oriflame world and start to make income from home! If you be in daily touch with me, ask me questions, learn from me, then you can become a Manager in Oriflame. When you join Oriflame in India, you will also get exciting welcome program gifts. Place a total order of 100 Bonus Points in your first month in Oriflame & get Love Nature Face Lotion Tea Tree & any one flavor of Love nature lip Balm valued at Rs. 678 for Rs. 100! Place a total order of 100 Bonus Points in your second month in Oriflame & get any one shade of Giordani Gold Age Defying Compact Foundation SPF 15 valued at Rs. 1299 for Rs. 100! Velvety smooth, this lightweight cream-to-powder foundation evens skin tone and delivers a flawless finish for a more luminous complexion. With anti-ageing BeautAge Technology and special light reflecting pigments to enhance your skin’s natural radiance and minimize the appearance of fine lines. Blends effortlessly and evenly for a perfect finish throughout the day. 10 g.
Place a total order of 100 Bonus Points in your third month in Oriflame & get the Elegant Summer Hand Bag valued at Rs. 2199 for Rs. 100! This women's handbag in classic dark tan adds a feel of understated luxury to your work wear. The spacious main compartment & pockets will keep everything accessible & organized. For Joining Oriflame in June 2019 just SMS or WhatsApp your Name, Address, Date of Birth, email id. on 09820850522. Will get in touch with you in 24 hrs. Now you can join Oriflame in May, June or July 2019 and with my guidance you can qualify as a Manager in Oriflame in just a few months. When you grow to higher levels you can also attend international Oriflame conferences. Oriflame MLM leaders in India are going to Japan this year. Lets talk on the phone soon!